Use this process to reverse a payment that has already been entered (e.g. credit card payment has been receipted into the system but the payment is rejected by the bank). 1 Go to the transactions tab of the Debtor account. 2 Find the appropriate payment. PLEASE NOTE: Once the option Reverse Payment has been selected, this action cannot be cancelled. The date and period of the reversing entry via this method will be today’s date in the current period and not the original payment date and period. 4 If the payment had already been allocated to an invoice, then it will be automatically unallocated. 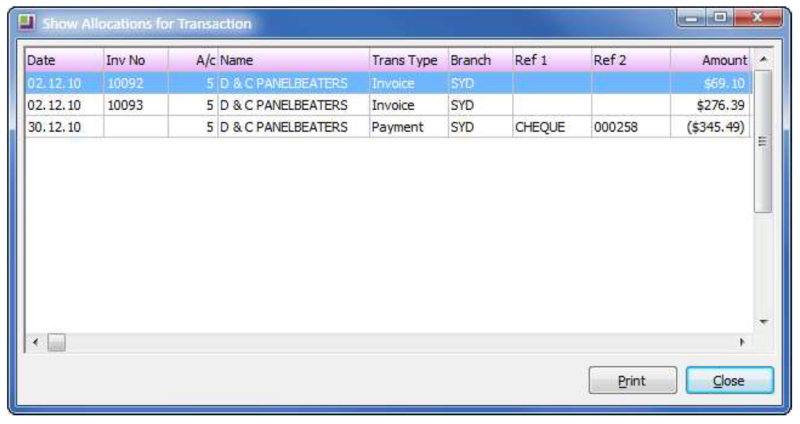 5 The original invoice will then show as unallocated in the transactions screen. 6 The following example shows the unallocation of a payment for $345.49 against two invoices. 7 The reversal transaction will be allocated to the original payment and will show as a refund in the transaction column. To view, unselect the option Show only unallocated. To show the return as a dishonour, edit the reference fields on the refund transaction and change the Payment Type to Dishonour. However the preferred method is a single credit payment. If you have already posted the payment to the General Ledger, you must create a new banking batch to post the reversed payment to the General Ledger.